Hundreds of DotA fans submitted signs written on pieces of paper for the Dota 2 beta key contest. Steven Addison (San Antonio, Texas) had a bigger idea - he was going to show his love for Dota 2 to the world by getting his own sign on a billboard along a major highway. We did a quick interview with Steven to document the task. 1) How long have you guys been playing DotA? I have never actually played DotA. I know I know, "TAKE AWAY HIS PRIZE, BURN HIM AT THE STAKE". I didn't get into the Dota genre till about a year and a half ago and then I went hard. I participated in the LoL beta like twice, enough to say "I want to play the jester guy!" but that was about it. My friend Clay (the other guy in the picture/video) did, however. He played the first incarnation of it before anyone knew much about it and had no idea what he was doing, and pretty much left it at that. Some time later, his friends started to get pretty big into it which drew him back in for another go, at that point, he still knew nothing, but gave it some attention here and there. 2) Why do you want to be in the Dota 2 beta? I didn't get into the Dota genre until a mutual friend of ours, who played League of Legends, begged us to give it a try, being free, we did and both of us fell pretty hard for it. Clay had been playing Heroes of Newerth (HoN) by this time with some of his friends that he worked with at a Cyber Cafe and that propelled him to going pretty hard on HoN as well. He eventually broke me down and I ended up buying a HoN account. After some conditioning and getting rid of a lot of my LoL bad habits, we both started playing HoN pretty regularly. We both were pretty big on wanting to try any DOTA genre games we could find (we even went back to try DotA, but the learning curve and the different content we had to learn was so steep we quickly abandoned that idea). 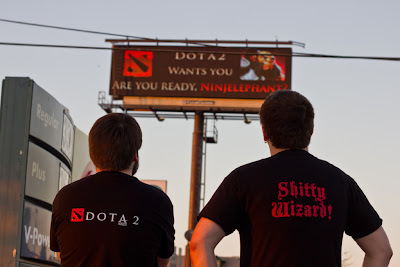 However, when Dota 2 was announced we both were very attentive to any details that were released on it. Initially, we were skeptical as to whether or not we wanted to play it, after all, we had two games that we've spent a fair amount of money on - do we really want to get into another one that's "the same game"? As we learned more and saw more, we talked more and more about it and started to discuss all the stuff in the original DotA as well comparing it to the other DOTAs out there and slowly became more and more excited about it. And then, there we are at 2:30 in the morning, watching 8 hours of stream for the Dota2 international competition when we both had work in the morning. Needless to say, we are no longer concerned as to whether or not we'll give Dota2 a try. Clay can't get enough of the art style and the more he sees the re-imagining of the heroes, the more he wants to change who he wants to play. I spend more money on Valve than I feel I ever should have but they've never let me down. I'm looking forward to getting a hold of a DOTA that has a group like Valve backing it. I'm pretty excited to see what their team is going to be able to do (and the hats for TF2... lets be honest). 3) How did you come up with the idea of getting a Dota 2 billboard for the contest? 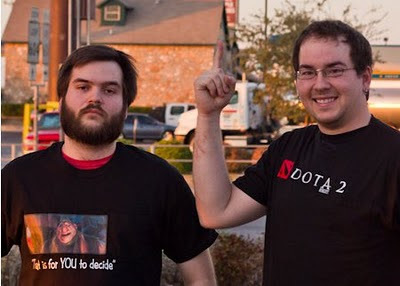 Clay heard about the competition first lurking on playdota.com and came to me to get a photoshop image made for him (before we knew shops would get you disqualified). I turned down the idea thinking anything that I could do, one of the other hordes of DotA fans could do MUCH better. But with the idea in mind, while I was driving down 1604 (the major highway that surrounds San Antonio), the billboard caught my eye as it changed it's advertisement. I suddenly wondered to myself how much something like that would cost since it's digital, maybe it wouldn't be so bad. I went home and looked it up; $3000 for one board for a month. 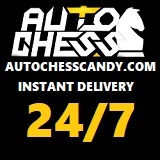 I almost abandoned the idea right then, but thinking better on it, decided to send of my contact info to the company. I mentioned it to Clay while I was looking it up and, while talking about it, he thought of the idea of implementing it into a film we're involved in, two birds one stone, so to speak. I sent the email Monday the 19th of Sept. That Friday, BJ from Clearchannel.com contacted me to learn more. I had explained in my initial email that we wondered if we would be able to rent some billboard time for MUCH less than the 1 month duration (like... a few minutes). When he called, I explained that it was for a film project for a class and that we'd only need it briefly in a shot we would make involving it. Not only did he tell me that was very possible, but when I asked him how much that would run me, he said "I used to be a photography student, I tried to do the same thing once and got shot down, so I know what you're going through. For school? Don't worry about it then, man, I'll take care of you." I'm, at this point, trying not to scream into the phone from yelling and celebrating. He gave me a few extra details on the requirements for the graphic and I told him I'd get back in touch with him. I immediately called Clay (who immediately after called Jason, who was creating the film) to tell them it was on and plan accordingly. Jason set to work readjusting the film to include this scene, and I put together the simple graphics to be displayed. I contacted BJ Saturday after ironing out everything with the film aspect and we set 7 pm Sunday evening as the start time. BJ said he would put it in the rotation with 8 other advertisements, it would come up every 80 seconds for 10 seconds, and he would leave it in rotation for 30 minutes. The clip on my stream was us burning our first couple rotations admiring it and trying to get pictures for the contest, we filmed what we needed (several times) after we knocked that out of the way. "3000 US Dollars for one board for a month - I almost abandoned the idea." 4) Overall, how much did the project cost you? 5) How long did it take for you guys to prepare for it? Prep time really wasn't too bad. I thought and acted on the idea Monday, was responded to on Friday and had it done on Sunday. Creating the graphic took all of 30+ minutes (refining it, getting the colors of my name and the text I wrote to match the Dota 2 text and the symbol colors, asking and re asking if it looks good, and another 15 minutes trying to decide if Axe was the champ we wanted to showcase). We spent the full 30 minutes while the image was running using it to take pictures and record and tweet and Facebook and anything else we could think of to shoot it out to the world. I guess you could argue it was a weeks worth of work and the combined efforts of 5 people. After all the hard work... the official entry. 6) Shoutouts to the people who helped you pull it off. Shout outs DEFINITELY start with BJ Stewart who is the Clear Channel Outdoor Digital Media Specialist for the San Antonio, Texas area. It seriously COULD NOT have been done without his generosity. I also want to thank Bexar who made himself ever resourceful in getting us these shirts, I owe that guy a WHOLE lot, he always has to find someone to pile on that debt I have to him. I also want to thank Jason Crow for photographing the whole event and getting us some super high quality images and quality adjustments, you can see more of his work at www.youtube.com/shatteredskullprod. I want to thank all my friends who saw us through this and gave all kinds of emotional support, most specifically - Katie, The Peter Tribe (Chase, Hutton and Evan), Alex, Rita, both my family and Clays. Finally, I definitely want to thank my best buddy Clay Beitel for bringing the competition to me and being as head over heals for the whole project as I was to make sure it went as best it could. 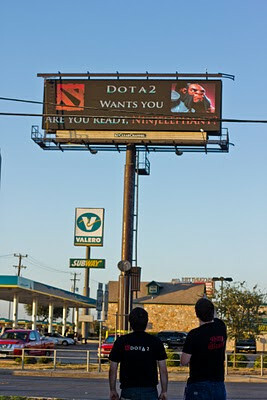 Steven Addison is a Dota genre fan who got a Dota 2 billboard in order to win a Dota 2 beta key. He hails from San Antonio, Texas. Damn, this guy's in the next level. I'll destroy this guy in pudge wars.